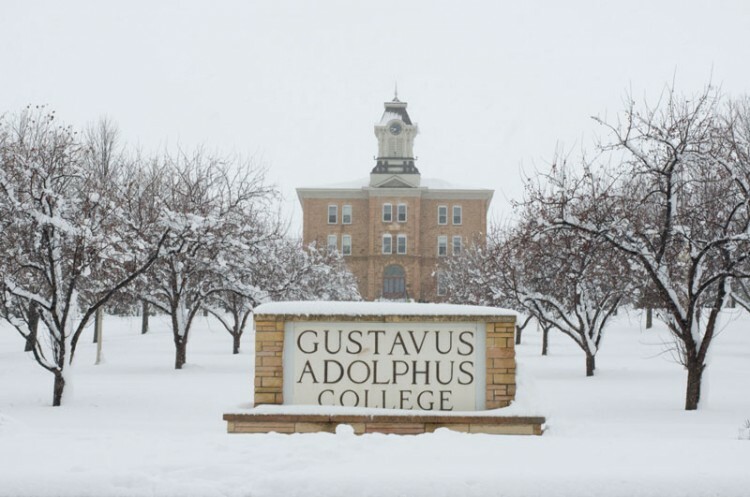 CLOSING EARLY: Gustavus Closes at 12 p.m. The College will close at 12 p.m. on Thursday, February 7 due to winter weather. The cafeteria will remain open until 7 p.m.
SUBJECT: Gustavus Campus Closing Today at 12 p.m.
Gustavus will close today at 12 p.m. today due to the winter storm. The National Weather Service has issued a blizzard warning for Nicollet County beginning at 12 p.m. and continuing until 12 a.m. on Friday, February 8. Snow is expected to continue throughout the afternoon as winds pick up and the temperature falls. The Folke Bernadotte Memorial Library will close at 12 p.m. Lund Center will close at 1 p.m. The cafeteria will remain open until 7 p.m. (Students employed by Dining Service are expected to report to work as scheduled or contact a supervisor.) All other campus buildings are closed until the campus re-opens. All employees whose role does not require them to stay on campus are released at noon. Please contact your supervisor if you have questions. Thursday’s Employee Enhancement Day activities have been postponed until Friday, February 8. Marni Dunning’s session, “Create Spectacular Surveys Using Qualtrics,” has been rescheduled to Friday at 11 a.m. The 12 p.m. session with Mary McHugh, “Data Review,” has been moved to Friday at 12 p.m. Physical Plant staff continue to remove snow and apply salt, sand, and de-icer to campus sidewalks and parking lots, but cycles of freezing rain, subzero temperatures, and repeated snowfalls have caused particularly slippery conditions. Students and staff are encouraged to wear appropriate winter footwear, allow extra time, and exercise caution when walking on campus. Please limit unnecessary travel and remain aware of weather conditions. The College will continue to monitor conditions and communicate any changes to the campus community.